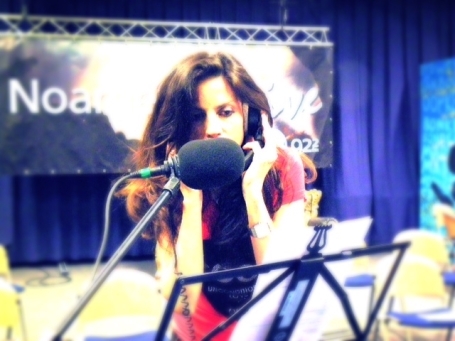 Denise Stahlie Rivera is currently the American voice-over for the Royal Dutch airline KLM and Air France as well as Sky Team. She is frequently asked to do voice-overs for Endemol and Eyeworks (now Warner Bros.) Children can read along in Spanish on the ipad, smartphone and tablet with Denise on Piccolo picture Books as well as on the app Tummy Tom (Dikkie Dik). Denise is very good at imitating accents and was asked to do a Vodaphone production with a British accent. She was also asked to imitate Princess Maxima (now the current Queen of the Netherlands) for several radio commercials and a popular navigation system. Denise's voice overs can be heard at airports, on airplanes, on websites, in children's books for the ipad, iphone and tablets, on several TV and radio commercials in the Netherlands, jingles in Spain and Greece, on TV commercials for the United States, Canada and Mexico, in Museums (van Gogh, Amsterdamse Grachten Museum) in VIP rooms (Sky Team), at the opening of NEON SPLASH, company presentations, company videos, instructions videos, movies (ZWARTEBOEK and ASTERIX AND OBELIX), language courses, on cd's and much more. Denise is also fluent in Dutch and has a good knowledge of French and Italian. She is also the proud member of " The Voice Team", a group of International voices available for multilingial, audio-visual projects.